Armstrong Community Music School is a leader in bringing music to our community, providing free or low-cost music classes in seven locations throughout Austin. ACMS is a long-term partner of community institutions where music is a tool for healing, rehabilitation, and skill building. Early Childhood Music Tuition Assistance - The Armstrong Community Music School is devoted to bringing music to the youngest learners. Scientific research has made clear the powerful importance of exposure to music for infants’ brain development and cognitive skills. Our classes give a welcome weekly social time for their families, who learn how to incorporate music and movement into a healthy daily routine for their children. Booklets and CDs are provided to each family bringing many hours of musical joy. For more information, please contact the Registrar at registrar@acmsaustin.org or 512 474-2331. The SAFE Alliance - Early Childhood Music education for mothers and their children is at the heart of what we bring to The SAFE Alliance, whose vision is a just and safe community free from violence and abuse. One of our earliest community partnerships, now in its 16th year, has been with SafePlace, which has now merged with Austin Children’s Shelter to become The SAFE Alliance or SAFE | stop abuse for everyone. We continue our focus on the therapeutic nature of music as a healing force, featuring music appreciation, playful movement activities, and instrumental jam sessions for children. ACMS has expanded its weekly music and enrichment programming into the University of Texas University Charter School at George M. Kozmetsky for kindergarten through 8th grade. Documented results include increased cognitive development, a greater interest in learning, and improved quality of life and self-expression. Todos Juntos Learning Center - Formerly the Sí Se Puede Learning Center Todos Juntos Learning Center is a nonprofit organization serving low-income Spanish speaking families by providing Adult Education services and Early Childhood Education. ACMS provides musical sing-alongs for the families as well as free CDs and advice on the importance of daily musical experiences for their young children. Professional musicians also visit periodically to provide free performances and further increase musical exposure. We Are the Chorus & We Are the Chorus, Too - WATC and WATC2 are ACMS’ resident choruses for adults and young adults with disabilities and their singing buddies (family and friends who rehearse and perform in the chorus). These enthusiastic musicians rehearse weekly and produce an annual musical. The original chorus, We Are the Chorus, is ACMS’ longest standing partnership dating back to2000. In 2018 We Are the Chorus, Too began for the next generation of musicians. Veterans Guitar Project - The Armstrong Community Music School is pleased to offer free weekly guitar classes and performance opportunities for all veterans. Experienced teachers guide veterans in increasing their musical skills while experiencing the healing power of music and group camaraderie. The afternoon at the music school includes an hour of socializing with coffee and cookies. Travis, Akins, & Lanier High School Child Development Center - Austin Independent School District provides nurseries enabling the teenage mothers at Travis, Akins, and Lanier High Schools to continue their education with the assurance that their children are being cared for. ACMS provides three Early Childhood Music classes weekly for these infants and toddlers. Children in the CDC receive critical developmental and emotional benefits from this interactive exposure to music. Periodically, their parents aregiven educational sessions so that they can extend these benefits into the home. Open Door Policy: Hosted Musical Artists & Community Organizations - The school has many partnerships throughout Austin, placing us as a center for music and social service in our city. We are proud to offer meeting, workshop, rehearsal and performance space to musical artists, school faculty, groups and nonprofits. It is also our pleasure to have stellar musical organizations and musical artists as part of our school’s Artists-in-Residence program. Music for All: Creating Yes for Every Family - In collaboration with Education Service Center Region 13, ACMS provides monthly Early Childhood Music classes to visually impaired children and their families. These classes, combined with parent education presentations which are given immediately following, are designed to equip families to provide their children with stimulating musical activities at home. In addition to monthly offerings, ACMS provides quarterly and seasonal programming for Easter Seals and the Department of Health and Human Services, bringing music education to special needs families throughout the Austin area. 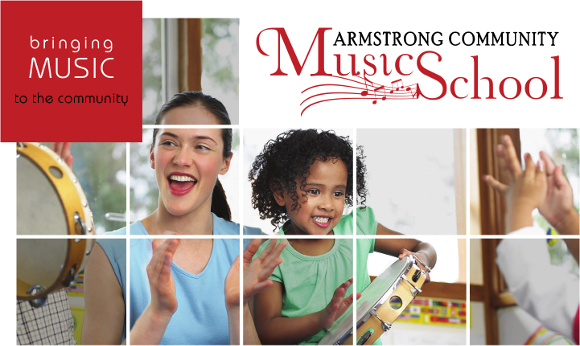 Armstrong Community Music School is a nonprofit organization offering exciting opportunities to learn the joy of music for students of all ages and skill levels, from early childhood to adult. It is our core mission to provide excellence in music instruction together with a commitment to providing extensive community service. Celebrate our school’s vital musical mission by giving a tax-deductible gift today!